A protest was held in front of the European Parliament on the 31st day of the hunger strike held in Strasbourg against the isolation imposed upon Kurdish People’s Leader Abdullah Ocalan. As the indefinite and non-alternate hunger strikes led by the imprisoned HDP MP Leyla Guven that spread to Hewler, Wales, Strasbourg and prisoners in Turkey and Kurdistan continue, a large scale protest rally was organized in front of the European Parliament (EP) in Strasbourg on Wednesday. Kurds and allies started to arrive in Strasbourg coming from various cities in Germany, France, Belgium, Switzerland and the Netherlands and gather in front of the EP. A thousand people gathered in front of the EP and started the rally at 13:00 with a minute’s silence. In the opening speech, the speaker stressed that the Kurdish people have no more patience for the isolation imposed upon Kurdish People’s Leader Abdullah Ocalan. The speaker expressed that protests against the isolation is a sign for that and added that the only institution with authority to visit Ocalan in Imrali is the Committee for the Prevention of Torture (CPT) under the Council of Europe (CoE). The speech was frequently interrupted by chants of “CPT to Imrali” and “Freedom for Ocalan” in French. Koma Berxwedan members Diyar and Hozan Semdin as well as many other artists attended the rally. The crowd chanted “Be Serok Jiyan Na Be” (No life without the leader), “Freedom for Ocalan”, “Fascist Erdogan”, “Berxwedan Jiyane” (Resistance is life) and “End the Isolation” as a large number of journalists follow the rally. Meanwhile, the 14 activists on the indefinite and non-alternate hunger strike in Strasbourg arrived in the rally grounds and gave interviews to European press talking about the hunger strike and the isolation. 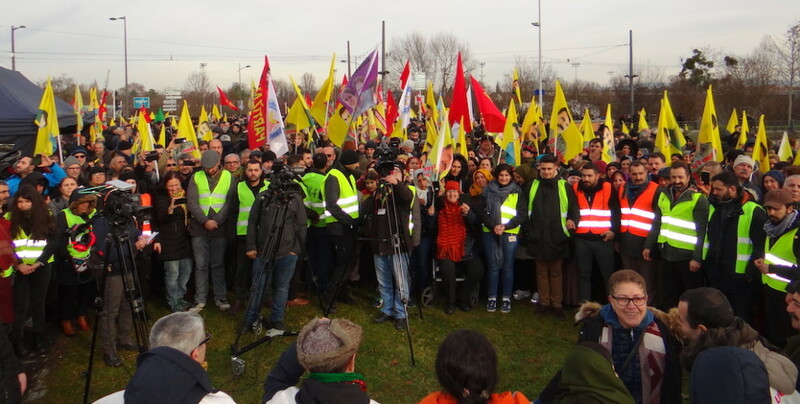 Kongra-Gel Co-chair Remzi Kartal spoke in the rally and said the hunger strike Leyla Guven started against the isolation has grown with the indefinite and non-alternate hunger strikes launched in Hewler, Wales, prisons and most recently in Strasbourg. Kartal stressed that the Kurdish people are in the streets to break the isolation against the Kurdish people’s Leader, to free him and to free Kurdistan, adding that a solution to the Kurdish issue and peace is only possible with Ocalan. Kartal added that the Turkish state has allowed a meeting with Mehmet Ocalan to hinder the dedicated resistance in the hunger strikes and that Leyla Guven and the hunger strikers in prisons have announced that they will continue their protests until the isolation is broken. Kartal said information about the health of the Kurdish people’s Leader has been provided but he hasn’t touched upon the hunger strikes, so the hunger strikes were announced to continue. Kartal added that they don’t expect anything from anyone regarding the isolation and that the Kurdish people and their children will continue their resistance until the isolation is broken. Gulistan Ike spoke in the name of the Freedom for Ocalan Initiative activists on hunger strikes and stressed that the very short visit with Ocalan is not meaningful for them. Ike said their goal is to completely break the isolation and stressed that they will continue their protest until they achieve results. Ike called on the Kurdish people to continue what has already been done and increase the scale. Yuksel Koc said Ocalan is the will of the Kurdish people, and the source of the new free life and peace in the Middle East and added: “We are resolute we will break the isolation through our resistance whatever the price may be.” Koc said the isolation shows hostility against the peoples of the Middle East and called on revolutionaries, democrats, leftists, human rights defenders and all opposition groups to stand against the isolation. Koc stressed that peoples in the Middle East, Kurdistan and Turkey can’t be free until the isolation is gone. Yuksel Koc said the isolation will spread in all areas and added that the CPT and CoE will have to take steps. European citizens arriving in the rally grounds expressed support for the resistance against the isolation. Representatives from an international NGO in Switzerland met with the hunger strikers to learn about their health. An NGO representative who wished to remain anonymous stressed the importance of the struggle against the Turkish state’s and Erdogan’s fascistic policies. 9 activists from the New Woman, New Democratic Youth (YDG), Workers from Turkey in Germany (ATIF), Revolutionary Alevi Association (DAB) and the Hochtaunus Alevi Cultural Center had launched a limited and alternating hunger strike in Frankfurt in support. Activists on this hunger strike that is expected to end on Thursday on day 5 arrived in Strasbourg today to show their support to the protest against the isolation. DAB constituents, Partizan, Revolutionary Workers’ Associations Federation (DIDF) and several administrators from organizations in Turkey attended the rally.